The following two figures show you how this procedure works. Here, the fourth suggested PivotTable button is highlighted in the Quick Analysis tool’s option palette. 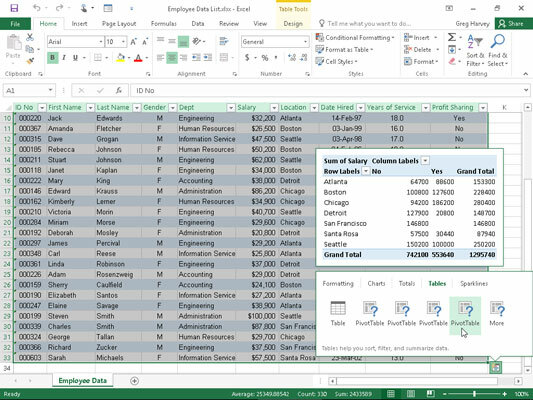 The previewed table in the thumbnail displayed above the palette shows the salaries subtotals and grand totals in the Employee Data list organized whether or not the employees participate in profit sharing (Yes or No). Previewing the pivot table created from the selected data in the Quick Analysis options palette. The following figure shows you the pivot table that Excel created when the highlighted button in the options palette shown was clicked. 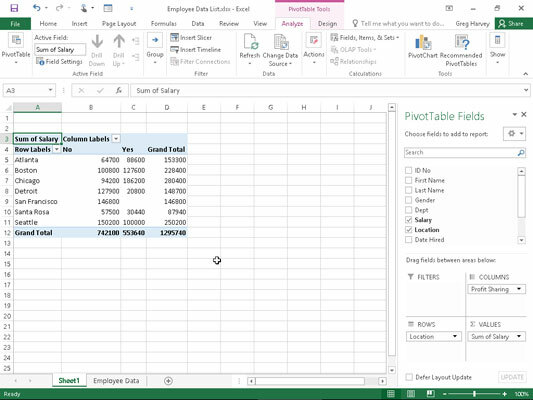 Note this pivot table is selected on its own worksheet (Sheet1) that’s been inserted in front of the Employee Data worksheet. Because the new pivot table is selected, the PivotTable Fields task pane is displayed on the right side of the Excel worksheet window and the PivotTable Tools context tab is displayed on the Ribbon. You can use the options on this task pane and contextual tab to then customize your new pivot table.